Lab My Life | Science + Business = ? : Are we going "Green" yet...in the lab? Thanks to global warming and Al Gore?! Everyone is going "Green" these days. Even here at our hospital (our research institution share the hospital building that is split between clinical wing and research wing) is starting to change lighting to more environmental friendly ones and putting up light switches in rooms where there was no light switch before!! Yes, that's right, the room had no light switch so the light was CONSTANTLY ON!! On the other hand, recycling in the US has been and I think still is way behind may other developed counties. There still are not as many recycling centers (I lived in the UK for sometime and they had facilities where people can bring stuff to for recycling) and not as many regulations for the waste (I lived in Japan for sometime and they had an excellent waste recycling instruction from the local government/authorities) . 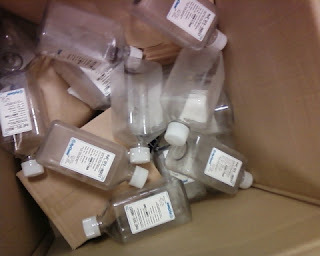 You may wonder what all these have to do with the lab. I was cleaning our 4 degree fridge today and had to throw away almost 20 bottles of old media. The bottles that I threw away were all plastics and I had no way to recycle them. I also started to notice the amount of plastics that we produce everyday (pipets, plastic bottles, plastic tubes). It is true that some of them are biohazard (contaminated with cells, blood etc) but what if we could at least separate the ones we know that are recyclable? such as the media bottles that I thew away? 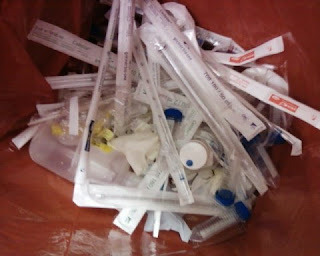 I wonder how much hassle it will casue to set up a policy within the hospital to start recycle plastic? It may not be practical and potentially dangerous (due to potential contamination) but it is maybe worth at least bring it up and talk about it?